New Vinyl Siding is a great way to enhance the look of your Wisconsin home especially if youère planning to resell. Wanting a nicer looking home isnèt always why homeowners choose to replace their siding. In the areas we service throughout Wisconsin our winter weather systems can occasionally damage your siding beyond repair. Brad’s Construction is a full service Vinyl Siding installation contractor specializing in siding repair, siding replacement and siding replacement due to storm damage and insurance claims. Vinyl siding is still one of the most popular choices for Illinois and Wisconsin homeowners because of the low maintenance requirements (pressure wash 1 or 2 times per year) and vinyl siding comes in a huge variety of colors and styles to enhance the looks and value of your home. Brad’s Construction sells and installs only Quality Vinyl Siding products so that your home is protected by the best vinyl siding material on the market and is supported with an outstanding warranty. Vinyl Siding Selection Tip: When you are looking at different Vinyl Siding manufacturers pay close attention to the thickness of the material. Most siding ranges from .030 to .050 inches and the higher quality vinyl siding will almost always be over .040 inches. Try to avoid vinyl siding under .040 inches! Brad’s Construction will provide you an estimate based on the square footage of your home exterior. We can offer you several different material options within your price range. 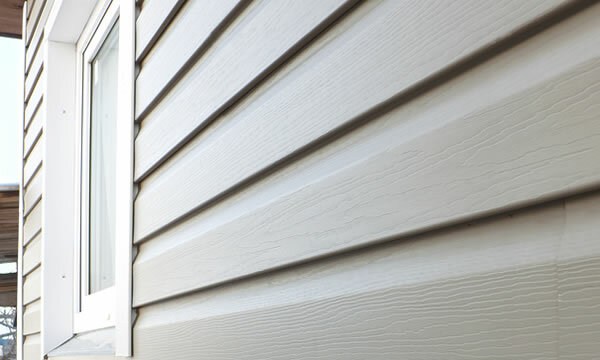 Siding is an important exterior decorating detail on your home, and helps protect the inner structure from the elements. One of the more common mistakes, or “time-savers” you’ll see with other siding contractors is their lack of attention to the finer details of a siding job, like making sure ends meet up around windows, and other areas that need to be trimmed. Professionals like Brad’s Construction will do a nice clean job for you, while the “other guys” will leave gaps, holes and other unsightly deficiencies with the installation. If you need new siding for your home then give Brad’s Construction a call today and one of our siding replacement experts can setup an appointment with you to discuss your project, answer your questions, show you some samples and help you take the next step in making your home look better. We realize that you’ve got many choices when it comes to choosing a vinyl siding replacement contractor in our Wisconsin service area. We want you to know we understand and appreciate the commitment you are about to make to your home and we take it very seriously. When you choose Brad’s Construction you’re choosing a partner in making your home a better place. We guarantee it!